The Knitting Pirate » In Which the Pirate Samples. « In Which the Pirate Clears the Bobbins. In Which the Pirate Samples. 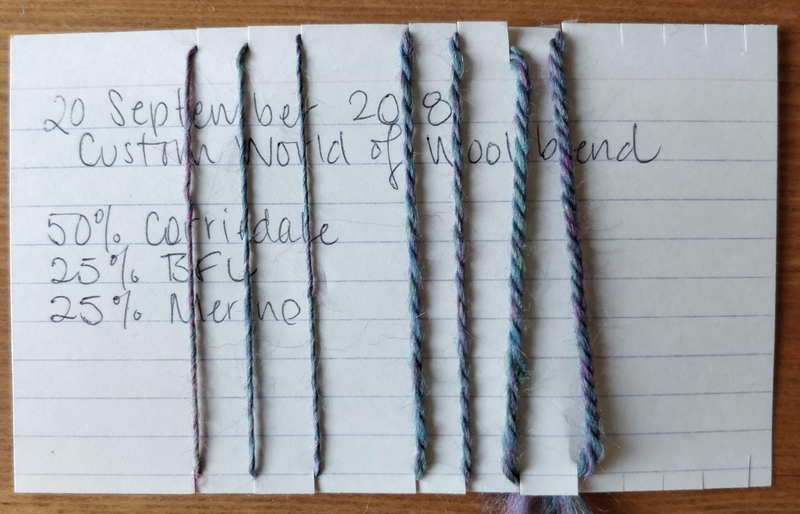 "World of Wool Custom Blend" was too boring for a project name, so I was going to pick something more descriptive and fun. 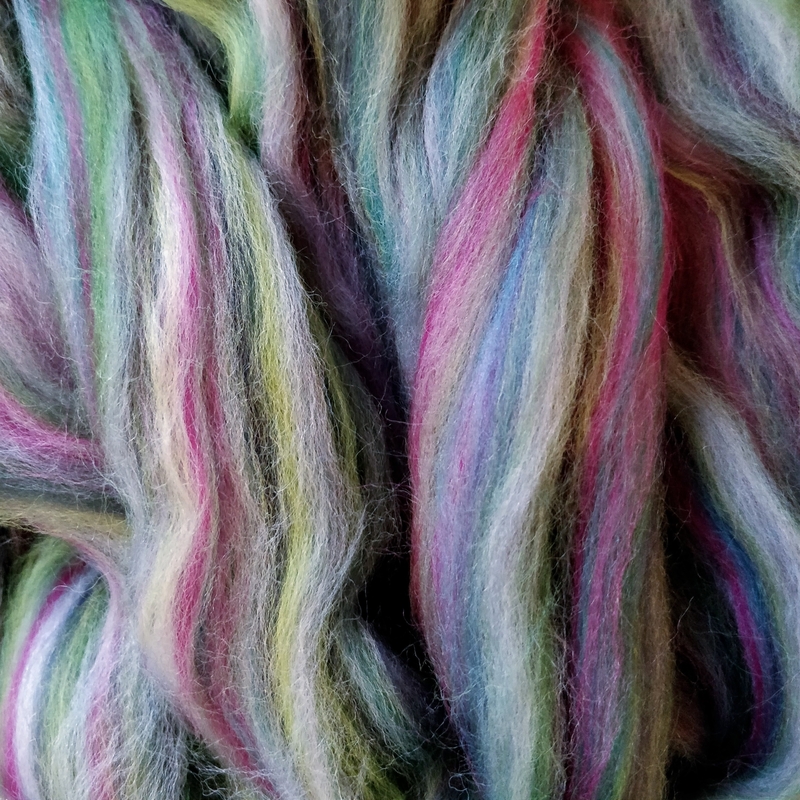 Every time I look at these colours combed together, all I can think is "Unicorn Spit"... so I guess that's what it is. Not too dignified, but certainly descriptive! Since I haven't done a project this ambitious before, I thought it might be a good idea to be deliberate and careful about how I proceed. 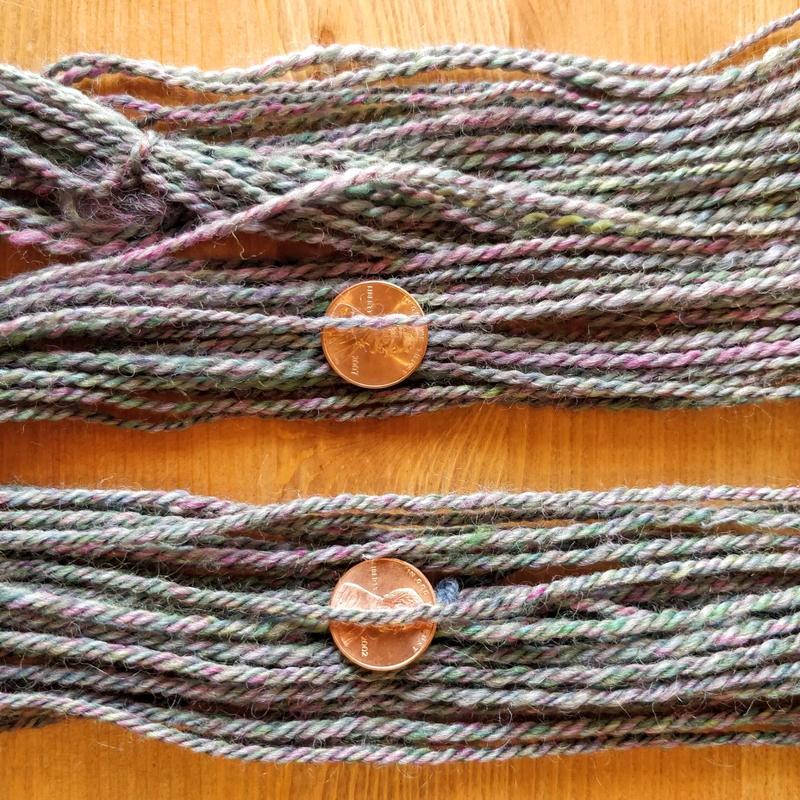 So I pulled off about half an ounce of fibre from the big bag and spun it into singles, then made a two-ply and a three-ply (actually chain-ply, but close enough) yarn to test. I even kept little samples of each step along the way, wrapped around an index card and taped on the back so it doesn't fall off. Then I washed my tiny skeins the same way I'll eventually wash the full-size ones: by soaking them for fifteen minutes in lukewarm water with a bit of wool wash, draining and squishing the excess water away, wrapping them in a towel and thwacking them a few times on the side of the tub, and finally draping them over a drying rack. This resulted in 22 yards of 16 WPI (wraps per inch) two-ply, and 13 yards of 12 WPI three-ply yarn. The three-ply is so much rounder and even, and at this point even without knitting a sample, I was already leaning towards choosing it. But being careful and deliberate requires swatching! Once the yarn was dry, I knit small squares of it. First I tried the three-ply on size 6 (4 mm) needles, but that seemed a little stiff. I knit a row of k2, yo as a separator and tried again on size 7 (4.5 mm) needles, and that felt much better. Then I knit the two-ply on size 4 needles. 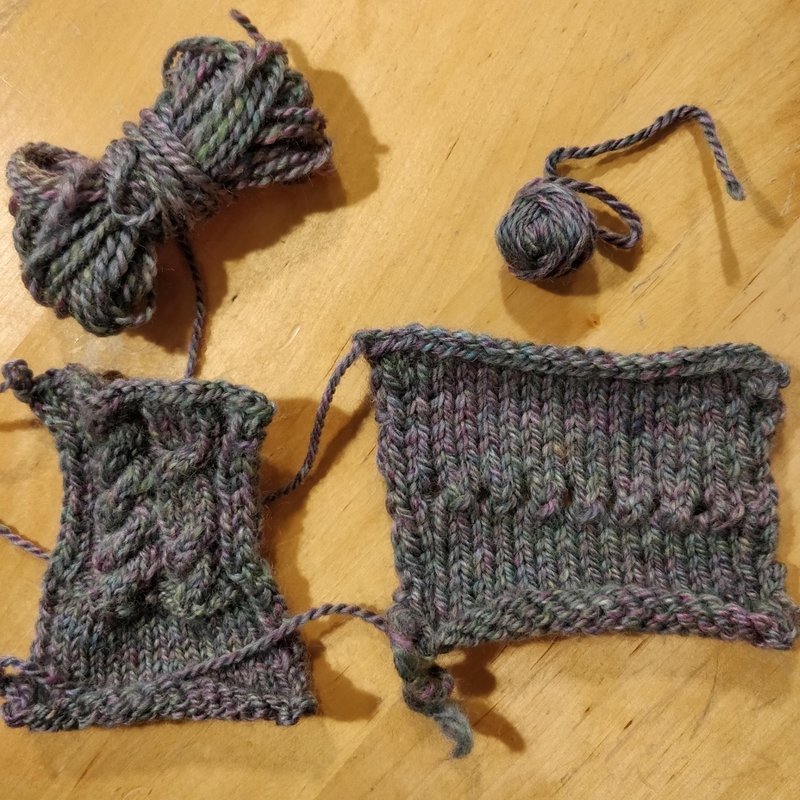 It was quite nice but thinner than I want the eventual sweater to be, so I started playing around with cable crossings just to see what it would look like. The answer was "really good, actually," but it's still not the yarn I'm imagining for my sweater. Overall, I am absolutely thrilled with the dusty teal colour of the yarn and swatches. The different greens and blues all heather together beautifully, and the pink acts to mute the saturation but still pops out just enough to give it some real interest. It's exactly what I wanted it to look like when I chose the eight different colours that went into the blend. It's not just the colour that I'm excited about, it's also that the feel of the swatch is perfect. It's smooth but not too soft; I don't think it will be itchy, but it should wear well and not turn into a felted pilly mess too quickly. With the sampling and swatching done... it's time to start spinning for real! This entry was posted on Friday, September 28th, 2018 at 10:00 and is filed under custom blend, fiber, spinning, Unicorn Spit, Unicorn Spit. You can follow any responses to this entry through the RSS 2.0 feed. Both comments and pings are currently closed.